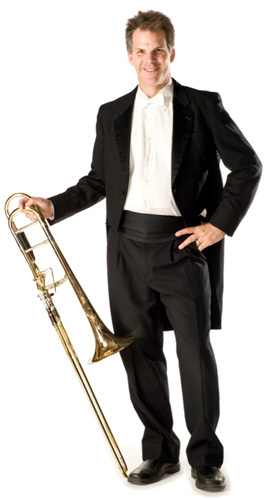 Michael Becker, Principal Trombone of the Tucson Symphony Orchestra, also holds the position of Second Trombone of the Arizona Opera Orchestra and Bass Trombone of the Britt Festival Orchestra in Jacksonville, OR. Formerly, he held the position of Second Trombone with the Honolulu Symphony Orchestra and served one year as Principal Trombone of the Savannah Symphony Orchestra. He has performed and recorded in orchestras across the United States and abroad, most notably in the Chicago Symphony Orchestra as first call substitute since being a finalist for that orchestra in 1989. As an active free-lance musician, he has toured and recorded with the Detroit Symphony Orchestra under Neeme Järvi, as well as the London Symphony Orchestra, St. Louis Symphony Orchestra, Lyric Opera of Chicago, the New York Philharmonic, the Malaysian Philharmonic, Bergen Philharmonic, Charlotte Symphony, Alabama Symphony, and the Atlanta Symphony Orchestra. Mr. Becker has also has toured with Yo Yo Ma’s Silk Road Ensemble. In 1995, Michael had the honor of being chosen to perform with Sir Georg Solti’s World Orchestra in Geneva, Switzerland, and subsequently in Baden Baden, Germany, and London. Prior to joining the Britt Festival Orchestra, he held positions on bass and tenor trombone with the Colorado Music Festival, Grand Teton Music Festival, Grant Park Symphony Orchestra, Ravinia Festival, Cabrillo Festival, Chautauqua Festival and Arizona Opera’s Wagner Ring Cycle. As an active teacher, he served as Adjunct Professor of Trombone at the University of Hawaii, Manoa, Visiting Professor of Trombone at the University of Georgia and Northern Arizona University. Michael continues to appear as guest clinician and recitalist throughout the country. In 2005, Mr. Becker created and launched the annual Becker Low Brass Boot Camp in Tucson, Arizona. This weeklong intensive workshop attracts students and young professionals from around the country who are pursuing a career in symphony orchestras. German lieder, such as Schumann , Schubert and Brahms. Jazz, from bebop to contemporary. What I remember well is going to hear the Chicago Symphony Orchestra. It was a youth concert and I was about 12 years old. I was blown away! It’s hard to pinpoint my first performing experience, but the one that really sticks out for me is playing Mahler 3 with the Chicago Symphony at Ravinia. That was about 13 years after hearing that youth concert. I never would have believed it. It really chose me! I tried piano and Viola but they never stuck. When I picked up the trombone , I kind of just knew it was for me! Very hard to answer this one. I love playing Mahler and Bruckner. But Mozart Requiem is also one of my very favorites to perform. I love to play tennis in my spare time! Also love to hike and cook. Indiana university and Arizona state. The tennis courts!! The Desert Museum, raging sage coffee house,Casa Vicente.